When you go to an amusement park, where is the first section of the park you hit? For most people they are looking for fast thrills and action. They want the tallest and fastest rollercoasters that are going to take them to the edge of their seats. However, there is a ride in almost all amusement parks that tends to get overlooked by most guests. 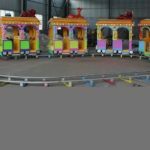 Do you remember the last time you took a ride on the amusement park train ride? 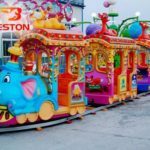 If you have bypassed the line for this nostalgic and restful ride. 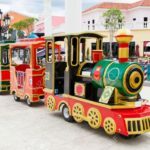 Train rides have been a staple in amusement parks for years. At one point in time, the only way to get into an amusement park was through the trolley system that ran into the park. Over time, this trolley would evolve into the train ride that many of us associate with modern day theme parks. 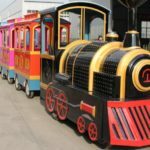 One of the earliest trains to be placed in an amusement park was the Zephyr Railroad in Dorney Park. 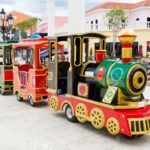 As park patrons began to enjoy the train ride more and more, the ride became a staple in amusement parks all over the country. One of the reasons people enjoyed the ride so much is it gave them time to sit and simply enjoy the sites. One of the best things about a train ride in the amusement park is it allows people the chance to just sit back and relax. Far too many people forget that a theme park is meant to be fun. By running from attraction to attraction you miss many of the finer details that are placed in the park. By taking the time to board a train, you get to look at the landscape, buildings, and details. It is quite possibly one of the best ways to get a full view of the park. As you may know, amusement parks are getting larger and larger. For many of us, the walk to get from one end of the park to the other is enough to put us out for the rest of the day. This is especially true once you factor in crowds and heat. It is no wonder so many people suffer heat-related injuries at theme parks! 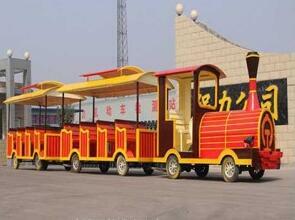 Amusement park trains offer visitors the opportunity to travel the park in comfort under shade. It is also a much quicker way of getting to those popular adrenaline-pumping rides. 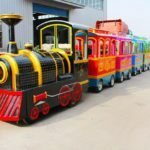 If you are traveling with younger children, the train ride is always sure to amuse and thrill them. Remember most toddlers are not too impressed with rides named Vortex and Dragon’s Fire! However, a train going choo-choo through a magical land is sure to impress. It is a great way for them to rest their legs and get out of the sun. 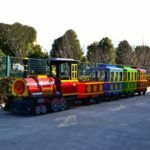 In many instances, the train becomes the perfect napping opportunity for children and parents alike! 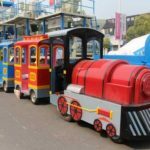 If you plan on visiting your favorite amusement park this season make sure you leave plenty of time to ride the train. It is sure to give your legs and body a rest while providing great memories as well!